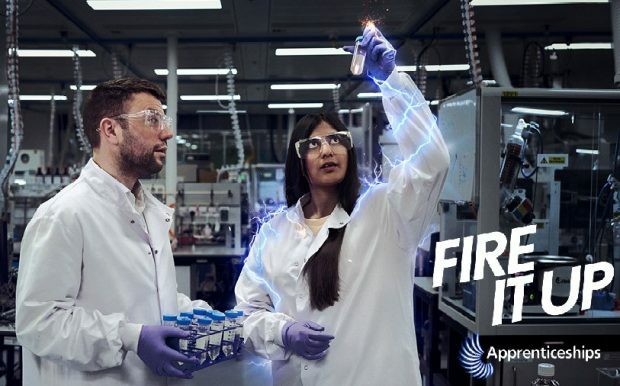 Today, Thursday 17 January, we have launched our new apprenticeships campaign: Fire It Up! The campaign is accompanied by a website and includes national television adverts as well as social media content and more. The launch has received coverage from the Times, TES, Schools Week and FE Week. Apprenticeships are a valuable and rewarding alternative to traditional higher education routes such as academic degree courses, and offer exciting opportunities for young people to get into skilled jobs early and ‘fire up’ their careers. You can see our nationally televised advert here, and have a look through our other social media content including the personal story of apprentices at the DfE. The sad truth is that outdated and snobby attitudes are still putting people off apprenticeships which means they're missing out on great jobs and higher salaries – many of them in the sorts of firms graduates look to land jobs with after university. Today, Thursday 17 January, the Education Policy Institute released a report on the early years workforce in England. This received coverage from the Telegraph, the Independent and the Mirror. The latest Ofsted report shows that 95% of early years providers are rated as Good or Outstanding – up from 68% in 2010. We want every child to have the best start in life, with access to early education that sets them up to succeed later in life. The vast majority of early years providers - 95% - are rated good or outstanding by Ofsted, but there is always more to do. That’s why we are improving the training and professional development available to the early years workforce, including through our £20 million programme targeted at those working in more deprived areas. We continue to work closely with the sector to look for ways to increase diversity among early years staff, provide better career information and support, and develop new criteria for early years qualifications to improve their professional skills. You can see the new criteria for early education and childcare workforce level 2 qualifications here. We are pleased to see positive stories in today’s national media on the work being done by schools to get more disadvantaged children and young people into top universities. The Times, Times Leader and the Daily Mail have reported on the success of Harris Westminster Sixth Form in London – a school which gives priority to disadvantaged children. The reports state that more than one third of their intake qualify for the Pupil Premium, and they have gone on to receive 37 offers from Oxford and Cambridge universities this year. This is a great achievement and we congratulate the sixth form and the students on their hard work. The Guardian, the Daily Mail and the Sun meanwhile has reported that 41 pupils from Brampton Manor Academy in east London will also attend Oxford or Cambridge after receiving offers. Despite being based in one of the most disadvantaged areas of the capital, the students at Brampton Manor have excelled, and two thirds of those accepting offers from Oxford and Cambridge will be the first in their family to attend university at all, whilst one of the students has come through the care system. This is a great sign of progress and again, we congratulate both the academy and the students on their achievements. Our review of post-18 education and funding is also looking at how we can drive up quality, increase choice and ensure value for money for students and taxpayers. Read more here about the Education Secretary’s ambitions to boost social mobility.